Two weeks ago, AMD launched its 7nm based Radeon VII – the Navi 20 for the gamer – and today we have the first authentic performance leak of the same card courtesy of TUM_APISAK. The source in question is extremely reliable and the only caveat with these numbers is going to be the driver version used – which might not be final. So expect these numbers to be slightly under what you can expect the final product to show. I took the liberty of tallying up the numbers in a nice graph and throwing in NVIDIA’s highest end GPU as well. Considering the Radeon VII has an MSRP of $699 while as the 2080 Ti has an MSRP of $999, this is not a fair comparison at all (inb4 the shilling comments) – the RTX 2080 at $699 would be better suited to the task but unfortunately I did not have one on hand to quickly run the numbers. 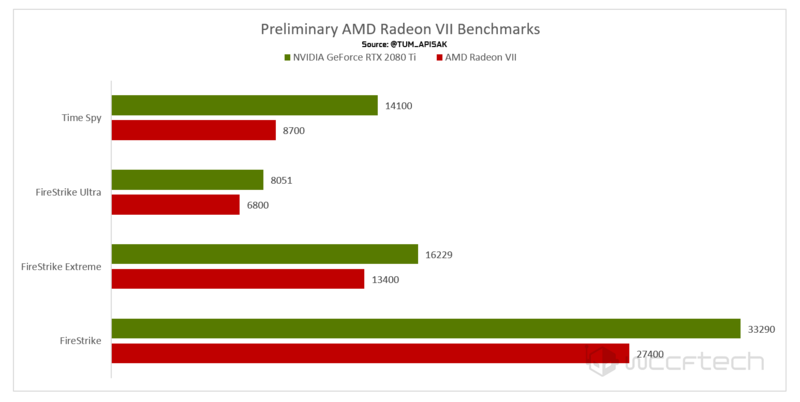 The AMD Radeon VII is roughly 30% slower than the RTX 2080 Ti on average based on these four results (but the price differential is 42% so it actually offers higher performance per $) . 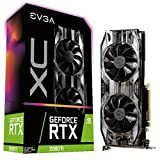 The numbers would put it competitively priced against the RTX 2080 which has the exact same MSRP as the AMD card. The HBM memory means that the distance would be less at higher resolutions like 4K where the situation becomes increasingly memory bound as opposed to lower resolutions where it is primarily shader bound. 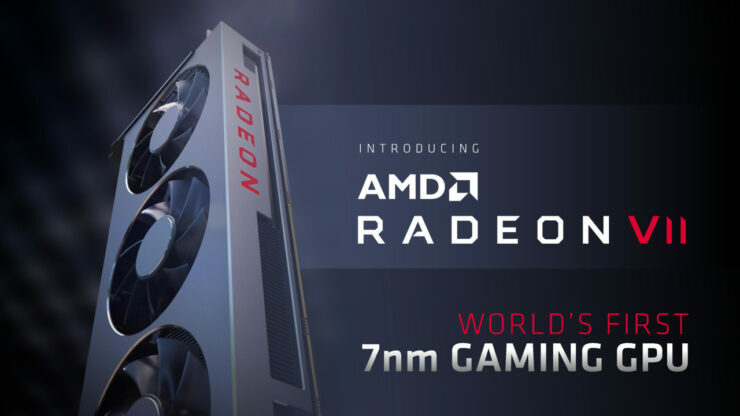 The Radeon VII is a much-awaited comeback from AMD in the high-performance gaming market and the Radeon VII rocks 3840 stream processors capable of handling up to 1.8GHz in clock rates. This puts its theoretical compute capabilities at a solid 13.8 TFLOPs. The power requirement will remain the same as its predecessor. The Radeon VII reference design rocks three fans on the shroud and looks like a beefed up Vega GPU. This is the 7nm Vega revealed at Computex last year, customized for the gaming/prosumer market. 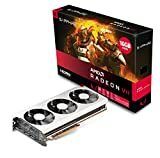 AMD has priced the graphics card very competitively at $699 and confirms that availability will be from February 7th. The pricing will put pressure on NVIDIA’s RTX lineup which has a typical MSRP of $799.